"A page turning mystery of gods behaving badly." Being the decedent of Greek Mythical creatures can have its pros and cons. Being able to freeze a person with a look helps when you are a Private Investigator but having Greek gods you thought were just were just stories calling you can be a bit nerve racking. Tori Karacis isn't your run of the mill LA girl. She's not even trying to make a career in TV or Films. Running her uncle's PI firm while he takes a personal hiatus is her main concern. Well, that and paying the bills. While on what seemed like a simple document delivery job, Tori witnesses the murder of an infamous talent agent. The perpetrator couldn't be described in any way other then odd. Seeing a man with scales and fins can make a person think differently about family stories that seemed to be nothing but tall tales. BAD BLOOD is an exciting story that uses Greek Mythology in a unique way. Set in modern Los Angeles, the story makes the reader wonder if the ancient gods could still be living among us. True to the myths, it seems that they are not all good guys. Any fan of the Olympians will love the way Diver has re-purposed the traits of the gods to fit into modern society. Through out the adventure set for us, the reader experiences great action and a true mystery. With so many suspects, it is difficult to determine who done it until the end. The development of relationships between Tori and her love interests is done wonderfully and adds the light feeling of a love triangle. Even though the romance is not the main focal point of the story, it blends in nicely with the mystery making all the plot points flow seamlessly. Overall, BAD BLOOD is a wonderful read. The mystery keeps the reader engaged, the action makes the reader want to roll with the punches, and the romance makes the senses tingle. This is a great book to coil up with on a lazy Sunday afternoon. Tori Karacis�s family line may trace back to a drunken liaison between the god Pan and one of the immortal gorgons. Or�maybe it�s just coincidence that her glance can, literally, stop men in their tracks. While her fear of heights kept her out of the family aerobatic troupe, her extreme nosiness fits right in with her uncle�s P.I. business. Except he�s disappeared on an Odyssean journey to find himself. Muddling through on her own, she�s reduced to hunting (not stalking, because that would just be weird) brass-bra�d Hollywood agent Circe Holland to deliver a message�only to witness her murder by what looks like the Creature from the Black Lagoon. Suddenly, all of her family�s tall tales seem believable, especially when Apollo�the Apollo, who�s now hiding out among humans as an adult film star�appears in her office, looking to hire her. She knows the drill: canoodling with gods never works out well for humans, but she�s irresistibly drawn to him. Maybe it�s her genes. Maybe not. 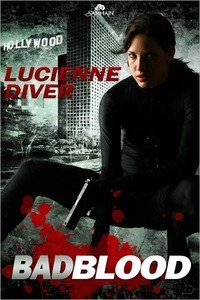 Given her conflicted feelings for one hot and hardened cop, it�s a toss-up which will kill her quickest. The danger at her door�or her love life. Warning: Contains pot-boiling passion between a heroine who may�or may not�be a descendant of Medusa, and a hot god and a hunky cop with the�equipment�to handle her, even on her worst bad-hair day. Beware of killer kisses, trickster gods and bearded grandmothers Who Know Everything.